d. good external load pilot. ferrying time nor sacking costs. Yellow Point Propagation, Campbell R.
Corda, Al. 1986. CONE RAKE PICKING IN FY 85 . Kootenai National Forest, Libby, Montana. 6 pages. SUMMARY: Includes data on collecting ES, Inland DF and WL, describes items affecting costs, rates, and safety, compares falling/picking with aerial raking and gives operation recommendations. When compared to Fall/Pick/Salv DF, raking cost 2% more per acre but the advantages were: 1. getting seeds from larger gene pools, 2. reducing chance of "Imbreeding Depression", 3. finishing job sooner with fewer people, 4. reducing nursery costs, 5. gaining access to select trees in remote areas, 6. keeping trees growing. Georgia Pacific Corp. 1985. GLACIER HELICOPTER CONE PICKING 1985 DOUGLAS-FIR CONES . Clearlake, Washington. 6 p. SUMMARY: Explains picking rate variation (13-44 bu/h) and lists criteria for high production. In 3 days a Fandrich rake collected 474 bu of Douglas fir cones at 29 bu/h. Durham, Rose Marie & Wurm, Duncan C. 1985. CONES BY 'COPTER . "American Forests", November 1985. 3 p. SUMMARY: Describes collecting white fir cones in the Stanislaus National Forest, California. Aerial rakes cut collection costs in half and picked cones 36 times faster than climbers. Fandrich, H.E. 1985. COLLECTING CONES FROM A BROAD GENETIC BASE WITH A FANDRICH AERIAL RAKE . Presented at Western Forestry Genetics Association Meeting in Missoula, Montana. 9 p. SUMMARY: Includes aerial cone harvesting history and describes aerial scion collecting. In 1982, 64% of cones in Vancouver B.C. Forest Region were raked aerially. Rau, Clyde. 1985. SUMMARY OF 1985 AERIAL CONE HARVESTING CONTRACT . Olympic National Forest, Shelton, WA. 1 p. SUMMARY: Gives 1985 collecting rates. Pacific silver fir was collected at 62.5 bu/h, western red cedar at 22.2 bu/h, sitka spruce at 16.0 bu/h, Douglas fir at 11.0 bu/h and western hemlock at 9.8 bu/h. Cornell, Blaine L. 1984 & 1985. APPRAISAL FANDRICH CONE RAKE - STANISLAUS N.F. Stanislaus National Forest, Sonora, California. 12 p. & 2 p. SUMMARY: Describes project preparation & operation, compares aerial raking with other collecting methods, presents extraction and germination rates according to elevation, analyzes costs, and suggests how to reduce cost. In 8 days, a rake collected 1080 bushels of white fir from 1168 trees at 44.7 bu/h; these cones yielded 2.4 lb seed/bu (climbing yielded 1.6 lb/bu) at a cost of $15.98/lb. Hedin, I.B. 1983. AERIAL CONE COLLECTION TECHNIQUES IN BRITISH COLUMBIA . Technical Note No. TN-69. Forest Engineering Research Institute of Canada, Vancouver, British Columbia. 55 p. SUMMARY: Describes 12 aerial topping and raking collections, including cone volume and weight, cycle and ferrying times, and costs. An average load of 8.5 bu of amabilis fir weighed about 550 pounds. Rau, Clyde. 1982. AN EVALUATION OF AERIAL CONE HARVESTING ON THE SHELTON RANGER DISTRICT, OLYMPIC NATIONAL FOREST SEPTEMBER 22 & 23, 1982 . US Department of Agriculture, Forest Service, Shelton, WA. 3 p. SUMMARY: Describes preparations, operations, production rates, costs, and evaluations. In 8 hours the Fandrich rake collected 319 bushels of Pacific Silver fir at $16.00/bu and 17 bushels of Western hemlock at $100.00/bu. Bray, B. & McLean, H. 1982. OPERATIONAL TRIALS OF THE FANDRICH BRANCH COLLECTOR . Ontario Ministry of Natural Resources, Timmons, Ontario. 37 p. SUMMARY: Describes raking in Northern Ontario. White spruce harvesting rates varied 9-16 bu/h. The following data give some of the cone collecting rates using Fandrich aerial cone rakes. Sharp knives on the Fandrich Branch Collector 'prune' the tree but leave the treetop intact so that the tree continues to grow. The stress caused by the pruning may actually stimulate the tree to produce a larger volume of cones in future years. FROM THE TOP WHERE THE BEST CONES GROW. From I.B. Hedin, Aerial Cone Collection Techniques in British Columbia, FERIC Technical Note No.TN-69, June 1983; with added notes. The production rate of Fandrich aerial cone rakes is affected mainly by the density of the cones near the tree-top, the density of collectable trees in the stand and the distance between the trees and the unloading site. Other factors that influence the production rate are the species being collected, the shape of branches and treetops, the skill and speed of the pilot, the size of the helicopter, the efficiency of the ground crew, and the type of Fandrich aerial rake used. As there are many variables from one collection to another, the table below should be used only as a guide to production rates. Estimate the number of trees required to collect one bushel of cones from the top 15 feet of the trees. Estimate the average distance that the pilot flies from the trees to the unloading site. From the table estimate the production rate in bu/h. For example, if the cone density is such that 1 tree is required to collect 1 bu of cones and the average distance from the trees to the unloading site is 1/2 mile, then the production rate should be about 46 bu/h. If the distance increases to 2 miles, the rate drops to 33 bu/h. Divide the cost of the helicopter by the production rate to get the cost per bushel. Add on the rental cost of the rake, the cost of picking, cleaning and sacking the cones, the cost of ferrying the helicopter and miscellaneous costs to get the total cost. The aerial cone rake should be transported by ground transport as close as possible to the unloading site. Ferrying the aerial rake reduces the helicopter air speed to about 80-90 mph. A normal one hour flight by helicopter would take 50% longer and cost about $200 more when ferrying an aerial rake. Helicopters with a load capacity of the Bell 206-L1 (Long Ranger) will be more productive than those with a lower capacity. Remove all removable equipment and material from the helicopter to keep the weight of the helicopter at a minimum. While harvesting carry only about an hour's fuel supply, plus an adequate reserve. The pilot should take a 15 minute break after flying an hour. He should fly no longer than 3 1/2 hours each day harvesting cones. The pilot is less efficient when he is tired. It would be advisable to have two pilots on the project, to alternate flying every hour. The daily ferrying time to and from the landing site would be divided over a larger volume of cones picked during 7 hours of harvesting, instead of over only 3 1/2 hours. The sacking rate is generally higher when the cones are transported to a more favourable environment. The pilot should plan flight paths that will minimize distance flown without raking. One plan would be to fly in ever widening circles with one part of the circle being close to the landing site. Generally the raking should be done while flying towards the landing site since the helicopter flies faster empty than when fully loaded. The unloading site should generally be below most of the cone crop since a loaded helicopter flies slower upwards than downwards. Experienced pilots with vertical reference skills, who feel comfortable hovering over forest canopy usually have higher production rates than less experience pilots. The encircled tree should not be allowed to move out of the fibreglass cone if a second pass is to be made. Generally after one or two passes the remaining cones should be left and a new tree should be raked instead of trying to get the remaining cones with more passes. The use of a torquemeter mounted on a skid will permit the pilot to see a display of torque while watching the rake below to allow him to optimize the lift of the helicopter. Fandrich Cone Harvesters are designed to collect seed bearing cones or scion material with the aid of a helicopter. After the pilot lowers the harvester over the top 10-15 feet of the tree, he raises the machine to remove the cones and branches from the tree. The collected branches and cones fall into a bin surrounding the harvester head. The full bin is dumped at a central unloading site. The Fandrich Cone Harvesters are connected to the cargo hook of the helicopter so that in case of a problem, the pilot can release the harvester at any time. Patents for all cone harvesters and scion collectors are pending. The sharp knives on the Fandrich Branch Collector are designed to cut the cone-laden branches. The force necessary to cut the branches is supplied by the lift of the helicopter. The collector has no moving parts. The branch collector is used where some tree damage is tolerated. Even though most of the top branches are cut off, the top usually remains and the tree continues to grow. The Fandrich Balsam Rake pulls the cone-laden branches through uniquely designed fingers that strip the cones but allow most of the bunched branches to pass through without breaking off. The cones and some branches fall into the holding bin for transport to the central unloading site when the bin is full. The balsam rake is used for collecting balsam and large diameter cones, (4 cm or larger). The stripping action of the rake is easier on the helicopter and pilot than the cutting action of the branch collector. The rotating tines on the Fandrich Rotorake remove most of the cones from the branches as the harvester is lowered over the tree. Some small branches are also removed but the main stem remains on the tree. The power to drive the rotating tines is supplied by a gasoline engine, and not by the lift of the helicopter. The knives on the periphery of the opening of the Fandrich Tree Topper sever the tree bole with one cut. After about 5-10 tree tops have been cut, the helicopter pilot unloads the tree tops at a central location where the cones are manually removed from the branches. The knives on the Fandrich Scion Collector cut the branches of 'plus' trees. Because it is smaller and lighter than the cone harvesters, it can be ferried more quickly. It is designed to collect branches from two or three trees. At the unloading site, the pilot lowers the collector to the ground where the ground crew attaches the chain link on the suspended cables to the wire bin. As the pilot lifts the helicopter slightly, he thereby raises the bin so that the cones and branches fall out of the bin. Then the pilot lowers the collector again to allow the ground crew to unhook the chain link. Set the 8 feet diameter wire cage on top of the fibreglass cone so that the cage sits on the bottom lip of the fibreglass cone. Lay the three double cables out to their full length (approximately 35 ft). Untangle the cables and place them parallel to each other. a. For the FANDRICH BRANCH COLLECTOR & BALSAM RAKE:	Attach the free end of each of the three double cables to the three metal lugs at the bottom of the fibreglass cone. ENSURE THAT THE CABLES ARE SECURELY FASTENED. b. For the FANDRICH ROTORAKE: If assembled as a three double cable assembly, remove one double cable from the top ring and from the spacer bar. Separate the double cable into two sections. Attach one section to the centre shackle of each of the two remaining double cables so that there are four cable ends at the bottom and two cable ends remain attached to the top ring. Attach each of the four lower cable ends to the holes in the four corners of the ROTORAKE head. ENSURE THAT THE CABLES ARE SECURELY FASTENED. Pass the cables through the spiral rings so that the cable slips up and down easily in the spiral ring. If the collector heads are to be changed, remove the 12 bolts holding the head to the fibreglass cone. Replace the head with the new head and ensure that the red lug or other marker corresponds with the red paint on the fibreglass cone so that the 12 holes match up. Secure all 12 bolts. Fill tank with gasoline (not mixed with oil) whenever pilot refuels. Check chain tightness daily and tighten as necessary. Check for loose tines on rotating drum daily. Tighten as necessary. Clean air filter daily or as required. Change oil in the engine crankcase after every 25 hours of operation with SAE 10-30 oil or SAE 30 oil. Ensure that ALL the bolts fastening the cutting or stripping head to the fibreglass cone are secure. Ensure that the cables are securely fastened to the fibreglass cone. IT IS OF UTMOST IMPORTANCE THAT A CABLE CANNOT SEPARATE FROM THE CONE SO THAT IT DOES NOT FLY UP TO BECOME ENTANGLED IN THE HELICOPTER BLADES. Check that the cables are not frayed so they will not separate under load. Check that the cables are not tangled. a. the driving chain to the rotating rotors is tight. b. there is sufficient oil in the crankcase. c. the gas tank is full. For the Rotorake, start the engine. Just before takeoff move throttle lever to full speed. Attach the ring on the end of the cables to a swivel hook and on to the cargo hook of the helicopter. Ensure that the cables do not tangle on liftoff. Centre the harvester over the tree. Ensure that no other tree or snag interferes with the helicopter. Drop the harvester over the tree until either the harvester is below the majority of the cones, or until the branches stop the harvester from dropping further. BRANCH COLLECTOR or BALSAM RAKE: move the harvester over so that the tree trunk enters one of the slots; sometimes the helicopter may be moved up to help the tree enter the slot. TREE TOPPER: move harvester against the tree. Move the harvester up to cut or strip the branches. Lower the harvester again if all the cones have not been harvested and repeat the procedure. If the branch collector or rake gets caught on a branch, lower the harvester, move the tree trunk out of the slot, and raise it above the obstruction without cutting the branches. Lower the harvester at the desired location. Continue lowering the helicopter until the cables are slack enough for the ground crew to hook the chain links on the cables onto the wire cage. Raise the helicopter so that the cables tighten, thereby raising the wire cage only. Continue raising the helicopter until the cables between the wire cage and fibreglass mold tighten and the whole harvester is free of the ground. At this stage, most of the branches and cones should have fallen free of the harvester. Drop the harvester and allow the ground crew to unhook the wire cage and remove any remaining branches. Carefully take off for another load. The production rate of the Fandrich cone harvesting systems is affected mainly by the density of the cones on the tree and the density of collectable trees in the stand. Other factors such as the distance between the trees and the unloading site, the species being collected, the type of branches and treetops, the skill of the pilot, the efficiency of the ground crew, and the type of Fandrich harvester used also influence the production rate. 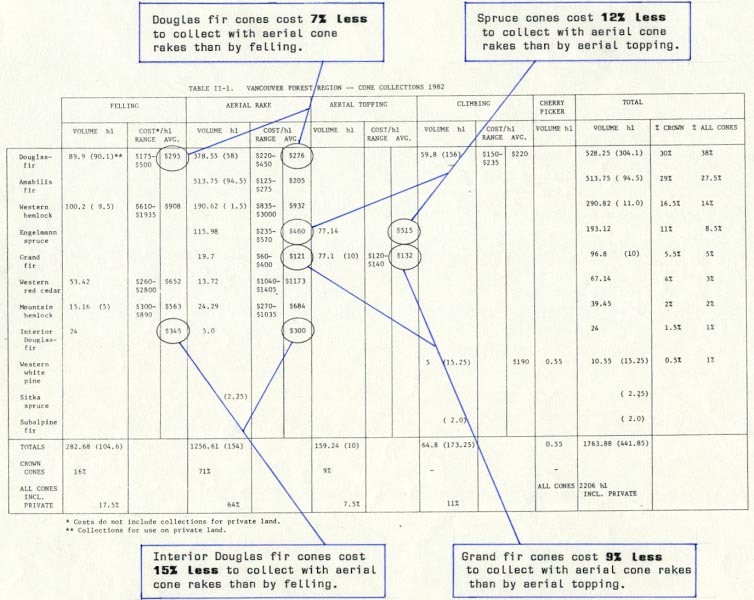 As there is a great variation from one collection to another, these tables should be used only as a guide, and not as a basis of actual costs. Estimate the number of trees required to collect one hectolitre of cones from the top 10-15 feet of the trees in the stand to be collected. Estimate the average distance in miles that the pilot flies from the cone-laden trees to the unloading site. Go to the table to estimate the combined helicopter and cone rental costs. For example, if the cone density is such that 6 trees are required to collect 1 hL of cones and the average distance from the trees to the unloading site is 0.5 mile, the combined helicopter and harvester rental costs would be $85.00 per hL. Add the cost of picking, cleaning and sacking the cones, and the cost of ferrying the helicopter. The above table was set up to enable the forester to estimate the cost of using the Fandrich Cone Harvesters. It is necessary for the forester to determine the density of the cone crop to be harvested in terms of the number of trees required to supply one hectolitre of cones and the average distance the pilot has to fly from the trees to the landing site. The number of trees in a stand that have collectable crops affects the production rate; generally the production rate is adversely affected if the pilot has to look for and fly some distance to the next collectable tree. The pilot can maintain high production rates if every third or fourth tree is collectable. Table I gives the estimated cost of aerial harvesting of cones using a Bell 206B helicopter and a rental rate for the Fandrich Cone Harvester for volumes in excess of 100 hL of cones. The table assumes that the flying time is 4 hours per day; if two pilots are available to fly the helicopter so that the flying time can doubled, the cost per hL is reduced by about 5%. The added advantage of two pilots is that the daily production can be doubled as well so that each hectolitre collected has a smaller proportion of helicopter ferrying costs charged to it. Table I does not include helicopter ferrying costs which may be a significant portion of the total cost if the collecting area is a long distance away from the helicopter base. Likewise the tables do not include costs of a ground crew. Generally the ground crew would also be sacking the cones so that the cost of the ground crew would be part of the sacking cost. Table II shows the result of a typical grand fir collection. The cost of this collection would be about $120./hL. Volume per load = 1.55 hl Turnaround time = 9.63 min.